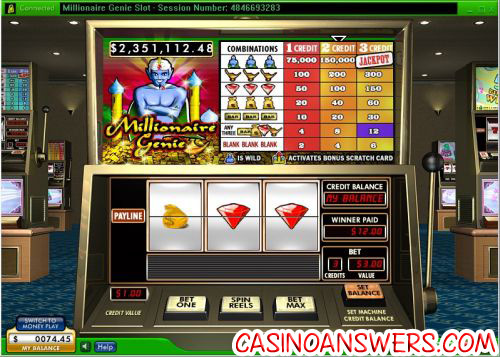 Millionaire Genie Progressive Jackpot Slot Guide & Review - Casino Answers! 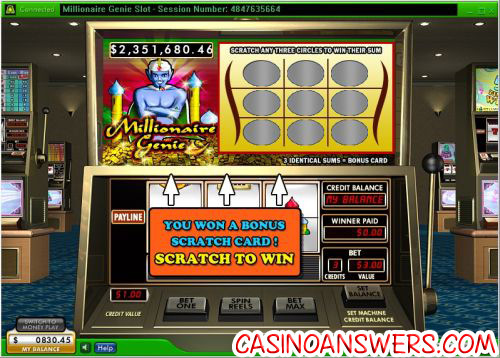 Millionaire Genie is a 3-reel, 1-line progressive jackpot slot machine featuring wild symbols and a bonus scratch card game developed by Random Logic. You can play Millionaire Genie at Lucky Ace Casino and Littlewoods Casino. Each coin (or credit) in Millionaire Genie represents $1. To play Millionaire Genie, you can either hit the “Bet One” for each coin you wish to bet followed by the “Spin Reels” button (alternatively, you can pull the lever) or you can hit the “Bet Max” button to bet 3 coins ($3). The only way to be eligible for the Millionaire Genie Progressive Jackpot is to play the maximum bet. To win the progressive jackpot on Millionaire Genie, you must play the $3 maximum bet. On a maximum bet spin, three Genie symbols must hit the payline in the center of each of the three reels. The name “Millionaire Genie” is no exaggeration, strike this jackpot and you will become a millionaire! The current Millionaire Genie progressive jackpot is at $2,351,639 – its highest ever! If you don’t play Millionaire Genie on the maximum bet, you may lose out on your chance to become a millionaire, but you can still win $75,000 on a 1-coin spin or $150,000 on a 2-coin spin. Still, imagine the sinking feeling you will have that you lost out on millions of dollars because you couldn’t shell out that extra couple of bucks per spin. That’s we at Casino Answers recommend you play the maximum bet on Millionaire Genie! The Genie symbol will not only win you the progressive jackpot on the Millionaire Genie slot machine, but it is also a wild symbol. It will substitute for any other symbol in the game to complete a winning combination. The Genie wild symbol will substitute for blanks. The Palace symbol on the Millionaire Genie classic slot machine is the bonus symbol. Hit one of these bonus symbols on the center payline and you will trigger a scratch card game! In the scratch card game, you must scratch three of the nine spaces on a 3X3 grid. The three spaces will be added up to equal your winnings. For more on scratch cards, please read our List of Online Scratch Card Games article. Payouts on the Millionaire Genie progressive jackpot slot machine are (1/2/3 coin payouts in parenthesis): 3 blanks (2/4/6), any 3 of the next four symbols (4/8/12), 3 Bar symbols (10/20/30), 3 Money Bag symbols (20/40/60), 3 Diamond symbols (50/100/150), 3 Lamp symbols (100/200/300), 3 Genie symbols (75,000/150,000/Jackpot). While there are technically only 7 winning combinations in Millionaire Genie, you will win on any spin in the game that either has all symbols or all blanks. This includes the Palace bonus symbol. Win the Millionaire Genie Progressive Jackpot using the free cash you’ll receive from the 100% up to $200 signup bonus when you sign up today at Lucky Ace Casino! Are US players able to play and win the Millionaire Genie progressive jackpot? No, due to the fact that Random Logic casinos are not accepting registrations from players located in the United States. For a comparable US-friendly progressive jackpot, we recommend you play Jackpot Pinatas at Bovada. How do I win Millionaire Genie’s progressive jackpot? Make sure that you are playing Millionaire Genie on the maximum bet of $3 per spin (or 3 credits per spin). Then, keep playing and cross your fingers for three Genie symbols to appear on the center payline and you will win the Millionaire Genie progressive jackpot! Does the Millionaire Genie progressive slot have a bonus feature? Yes, all you need is a single Palace symbol and you will trigger the scratch card bonus game on Millionaire Genie. Scratch three spaces and you will win the cumulative total of the three scratched spaces! Mystic slot machine? Genie slot machine? What is the slot machine with a scratch card casino bonus game?